Smartphones often serve as a go-to source for staying informed about breaking news and community happenings, getting from place to place, conducting transactions, and navigating life events such as finding a new job or getting information about a health condition. This chapter of the report looks in more detail at the specific activities that smartphone owners engage in, and the types of information that they seek out on their mobile devices. 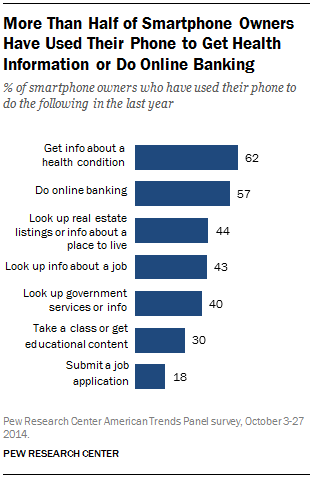 62% of smartphone owners have used their phone in the last year to look up information about a health condition. Lower-income and higher-income smartphone owners obtain certain types of information (health, education, or government content, for example) on their phone at similar rates, and higher-income users are a bit more likely to use their phone for real estate searches or to engage in online banking. However, lower-income users are substantially more likely to utilize their phone when seeking out and applying for jobs. Compared with smartphone owners from households earning $75,000 or more per year, smartphone owners from households earning less than $30,000 annually are nearly twice as likely to use their phone to look for information about a job—and more than four times as likely to use their phone to actually submit a job application. 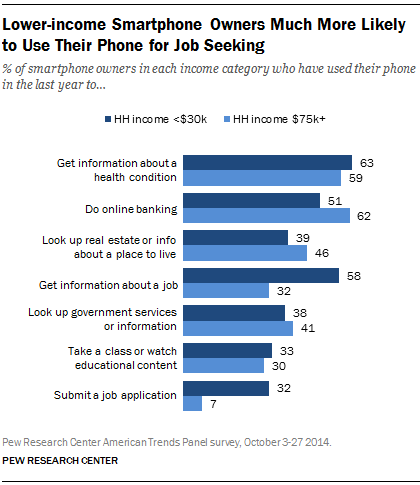 Just 7% of smartphone owners from higher-income households have applied for a job using their phone in the last year, but 32% of smartphone owners from lower-income households have done so. Similarly, “smartphone-dependent” users (that is, the 9% of smartphone owners who lack another form of high-speed access, and also have limited internet access options besides their smartphone) are much more likely than other smartphone owners to utilize their phone as part of a job search. Some 63% of these smartphone-dependent users have gotten job information on their phone in the last year, and 39% have used their phone to submit a job application. Where lower-income and smartphone-dependent users stand out primarily when it comes to using their phone for job resources and information, young adults incorporate mobile devices into a host of information seeking and transactional behaviors at a higher level than older users. Three-quarters of 18-29 year old smartphone owners have used their phone in the last year to get information about a health condition; seven-in-ten have used their phone to do online banking or to look up information about job; 44% have consumed educational content on their phone; and 34% have used their phone to apply for a job. 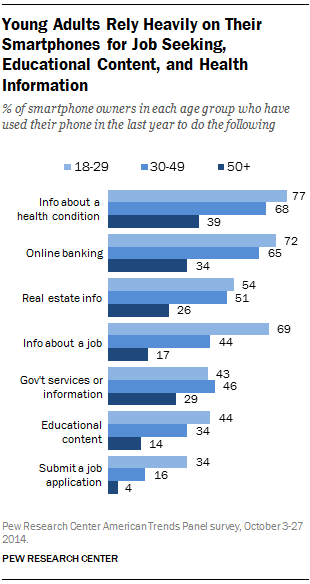 In each instance, these young adults are significantly more likely than smartphone owners in other age groups to use their phone for these reasons. Each of these behaviors is especially prevalent among younger smartphone owners. 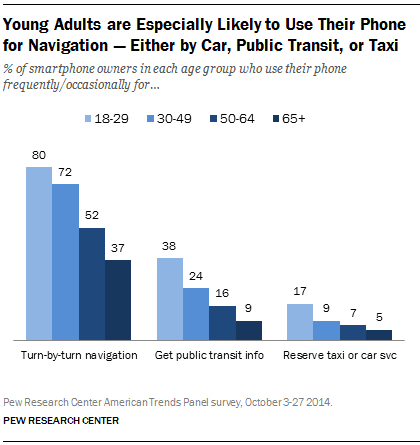 Fully 80% of smartphone owners ages 18-29 use their phone at least occasionally for turn-by-turn driving directions; 38% do so to get public transit information; and 17% do so to reserve a taxi or car service. Each of these is substantially higher than among smartphone owners in other age groups, although turn-by-turn driving assistance is relatively common across a range of ages. Whites, blacks, and Latinos are equally likely to use their smartphones for turn-by-turn driving directions and to reserve a taxi or car service, but African American and Latino smartphone owners look up public transit information on their phone at much higher rates than whites do (37% of black smartphone owners, 30% of Latinos, and 21% of whites do this at least on occasion). Residents of the transit-dense Northeast are also especially likely to access public transit information on a smartphone. Fully 41% of smartphone owners who live in the Northeast get public transit information on their phone at least occasionally, with 19% doing so “frequently.” By contrast, just 23% of westerners — and 20% of Midwesterners and southerners — use their phone for this purpose at least occasionally, and roughly six-in-ten Midwesterners and Southerners say that they “never” use their phone to navigate public transit. 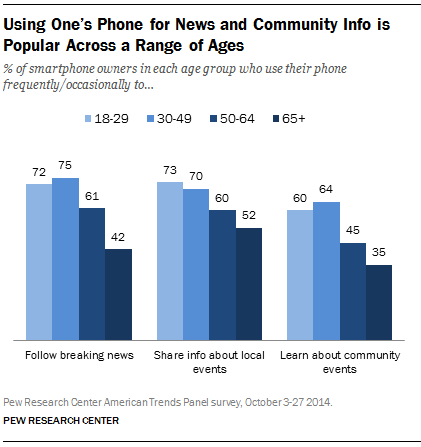 Using smartphones to keep up with breaking news, and to share or learn about local happenings, are each common across a relatively wide range of demographic groups. Smartphone owners age 65 and older are among the groups that are least likely to engage in these behaviors; even so, four in ten older smartphone owners use their phone at least occasionally to keep up with breaking news, while half use them to share information about local happenings, and one third use them to stay abreast of events and activities in their community. In addition, some 8% of smartphone owners use their phone at least occasionally to make a monetary donation to a charitable or political cause. 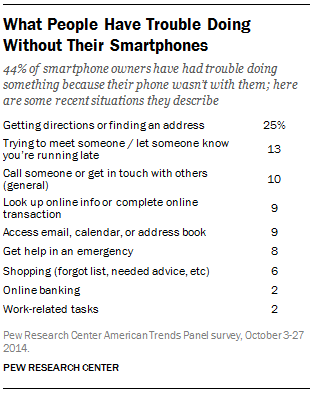 Just 2% do so frequently, and 77% of smartphone owners say that they never use their phone for this purpose. Overall there are very few demographic differences when it comes to using one’s smartphone to make a political or charitable contribution. Along with using their phone to share and keep up with neighborhood happenings, 17% of smartphone owners have used their phone to report a problem in their neighborhood (such as a pothole or missing street sign) to the local authorities. Those with some college education or a college degree are more likely to have done this with their phone than those who have not attended college (20% vs. 12%), and usage of smartphones for this purpose is more common among 50-64 year olds (22% have done so) than among those ages 18-29 (14%) or 65 and older (13%). 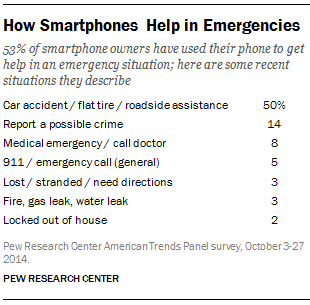 Fully 53% of smartphone owners indicate that they have been in an emergency situation where having their phone available helped resolve the situation.3 Smartphone owners in various demographic groups have encountered this situation at relatively high rates, although younger owners are especially likely to have used their phone in an emergency (59% of 18-29 year old smartphone owners have experienced this). An additional 14% of those who have been helped by their smartphone in an emergency said that they witnessed or experienced a potential crime and used their phone to get help or notify the authorities, while 8% described a recent experience in which their phone was helpful in a medical emergency. Reliance on smartphones can also have an unintended downside, as 44% of smartphone owners have experienced a situation in which they had a hard time accomplishing some sort of task because they did not happen to have their cell phone with them.4 When asked to describe a recent time that this happened to them, the largest group (representing 25% of those who have experienced the situation) mentioned having trouble getting somewhere because they didn’t have their phone to look up an address or get directions. When asked how they feel about their phones, smartphone owners paint a generally positive picture — connecting rather than distracting, helpful rather than frustrating, and ultimately worth the cost of ownership. But despite these benefits, users are fairly evenly divided on whether or not their phone is an essential component of their lives that they could not possibly live without. The survey presented smartphone owners with a series of phrases that might describe their phone, and asked them to choose the one that most closely matches how they themselves feel. The choices presented to them, and their responses to those choices, are discussed in more detail below. 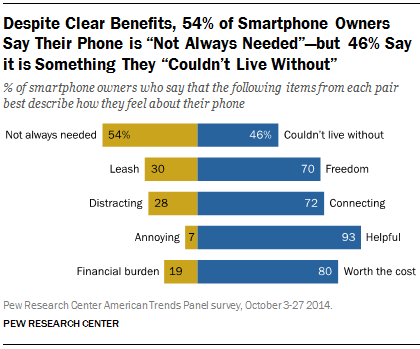 “Not always needed” vs. “Couldn’t live without” — Smartphone owners are nearly evenly divided on this question; 54% say that their phone is “not always needed,” while 46% say that it is something they “couldn’t live without.” Women and African Americans have higher than average levels of attachment: half of female smartphone owners (52%) say that their phone is something that they couldn’t live without (compared with 39% of men), as do 57% of African American smartphone owners (compared with 46% of whites). Interestingly, responses to this question are not correlated with whether or not someone has plentiful access options beyond their cell phone. Some 49% of smartphone-dependent Americans say that their phone is “something they couldn’t live without,” nearly identical to the 46% of users with more plentiful access options who say the same. Indeed, there are a notable lack of differences between smartphone-dependent users and other smartphone owners across all of these choice pairs. “Freedom” vs. “Leash” — A substantial majority of smartphone owners (70%) feel that their phone represents “freedom,” while 30% feel that it represents a “leash.” Older adults are actually more likely than younger users to find their smartphones freeing: 78% of smartphone owners over the age of 50 say that their phone represents “freedom,” compared with 66% of those ages 18-49. Similarly, 34% of 18-49 year olds say that their phone represents a “leash” (compared with 21% of those 50 and older). “Connecting” vs. “Distracting” — As with the “freedom” vs. “leash” choice pair, a substantial majority of smartphone owners (by a 72% to 28% margin) feel that their phone is “connecting” rather than “distracting.” This question also exhibits a relatively pronounced age split, with younger adults being more likely to describe their phone as “distracting.” Some 37% of 18-29 year olds selected the “distracting” option, compared with 29% of 30-49 year olds and 18% of those 50 and older. “Helpful” vs. “Annoying” — Fully 93% of smartphone owners describe their phone as “helpful,” while just 7% feel that “annoying” is a better descriptor. There is very little variation in the responses to this question, as every demographic group chooses “helpful” by an overwhelming margin. 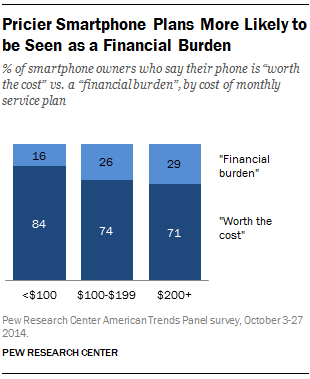 “Worth the cost” vs. “Financial burden” — A substantial majority of smartphone owners (80%) describe their phone as “worth the cost,” although one-in-five (19%) describe it as a “financial burden.” There is relatively little variation across demographic groups on this question, although users with expensive service plans are more likely to say that the cost of maintaining their service is a financial burden. Fully 29% of those who pay more than $200 per month for their cell phone service describe their plan as a financial burden, compared with 16% of users whose plan costs less than $100 per month.